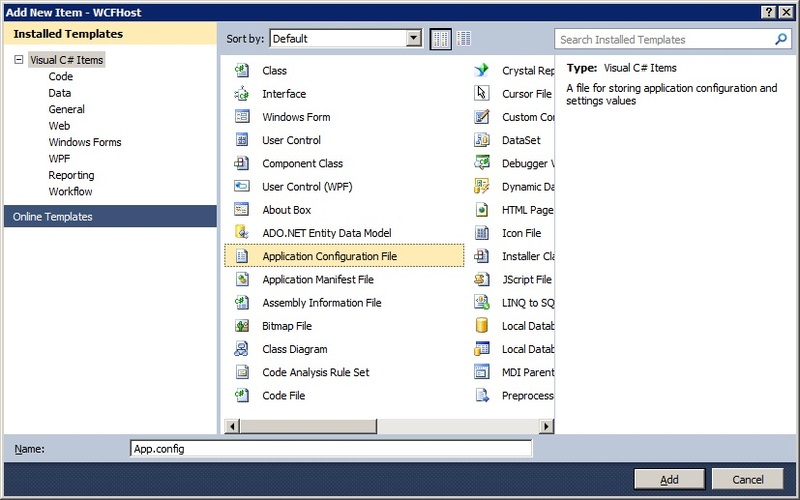 In this part I'm going to show you how to set endpoints inside app.config file instead of heaving them in code. This way we can easily change them in the future without need to recompile our application. Then I'm creating new tcp endpoint at address net.tcp://localhost:9000/tcp. 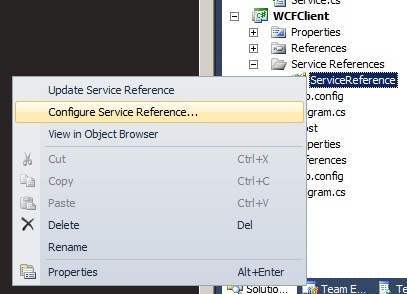 remove your service reference completely and add new service reference. 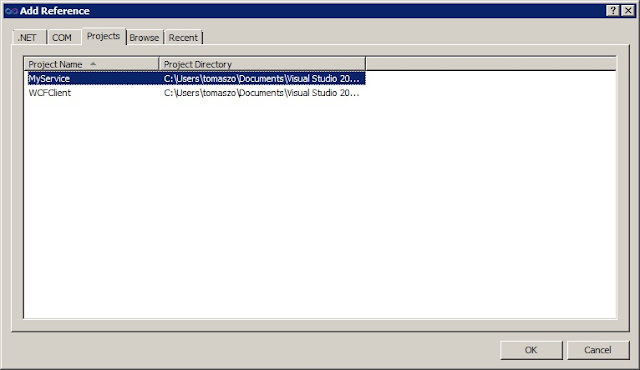 If it's discovered correct Namespace to ServiceReference and click OK.
Start you're client - it should connect to the host without any further changes needed. Endpoints using 'UriTemplate' cannot be used with 'System.ServiceModel.Description.WebScriptEnablingBehavior'. notice, there's no UriTemplate. Eventhough you can still navigate to: http://localhost:60377/TestSite/test.svc/GetMyList and it will retrieve JSON file. 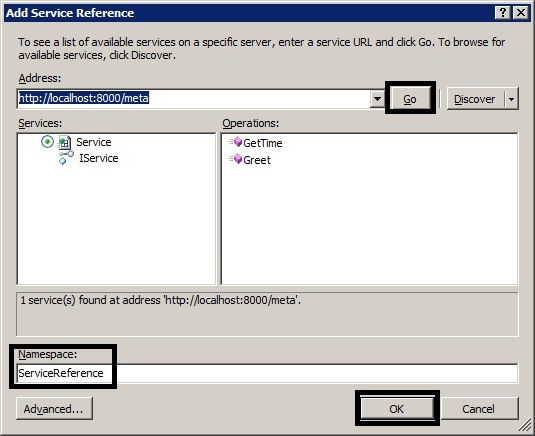 In this tutorial we're going to separate service from host. In my opinion it's a good pattern to have service separated from host. 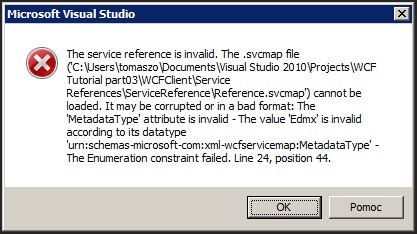 After this, drag IService.cs and Service.cs files from WCFHost to MyService project. Remove them from original WCFHost project. Change namespace in those files to MyService. Make interface and class publicly accessible by adding public modifier to their definitions. 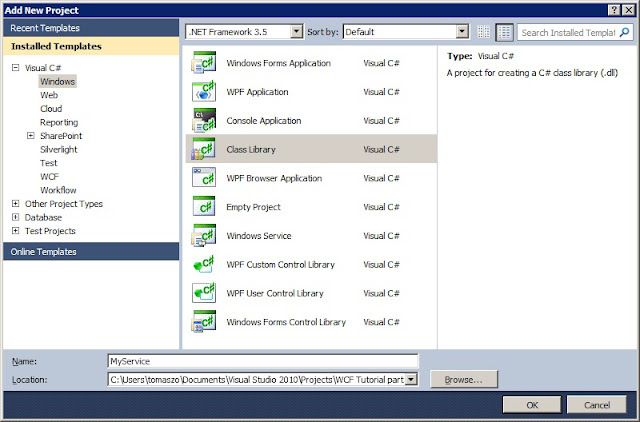 Build WCFHost project, this should build MyService library and copy the dll file to WCFHost project. 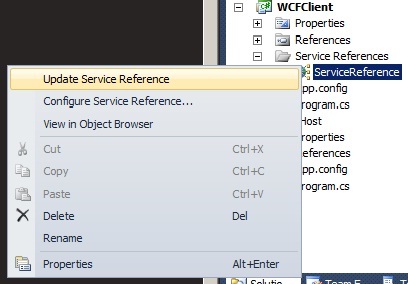 rightclick on Service References - ServiceReference in WCFClient project and choose "Update Reference"
start WCFClient project - there should be no errors.